In Dewey’s Nine Lives: The Legacy of the Small-Town Library Cat Who Inspired Millions, Vicky Myron offers nine stories about some very special cats, inspired by the thosands of letters and e-mails she received from readers around the world after the phenomenally successful publication of Dewey: The Small-Town Libary Cat Who Touched the World. In these letters, readers told Myron how Dewey had touched their lives and shared heartfelt stories of their own special cats. You’ll read about a determined black cat who changed a Vietnam veteran’s life for the better. You’ll hear about a spirited kitten who brings back one woman’s childhood memories of a lost mother. You’ll learn how a city cat with a rough start in life accompanies her adopted human through a series of major life changes. Myron chose inspirational stories about people who were down on their luck, who mostly came from small towns, and who were faced with tough challenges. Given Myron’s own background, it is not surprising that these stories resonated deeply with her. At times, the stories focus a little too much on the humans’ backgrounds, but in the end, it’s always the cats in the stories who not only saved the day, but often saved their humans’ lives – maybe not literally, but most definitely figuratively speaking. The cats in the stories are a testament to the healing power of cats – they opened hearts, inspired change, and transformed lives. Dewey himself is woven throughout the book. There are some Dewey stories that were not included in the first book, and Myron shares what her life has been like after Dewey. I was particularly delighted by the book’s final chapter as it answered a question I had been wondering about. Like most sequels, this, too, does not quite live up to the first book, but it is a thoroughly enjoyable, heart-warming book which will make you hug your own cats just a little harder and thank them for all they’ve brought into your life. Would you would like to see your cat’s story featured in the paperback edition of Dewey’s Nine Lives? Penguin Books is hosting an I Believe In Dewey’s Magic Story Contest, looking for true tales highlighting how a cat has impacted your life or the life of someone you know. 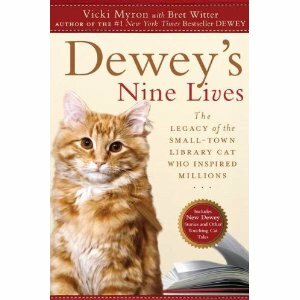 I’m giving away one copy of Dewey’s Nine Lives to one lucky winner. Leave a comment on this post to enter the giveaway. Tweet about it or share on Facebook and leave the link in a separate comment for an extra chance at winning. This giveaway ends on Friday, October 29. I would love to win the paperback copy of Dewey’s Nine Lives. I read this and Dewey: The Small- Town Library Cat Who Changed The World. I had spent all my money on cat food and checked out Dewey’s Nine Lives out from the library when it was released. (Just kidding). I read it, loved it and would like to add the paperback edition to my library to sit on my cat shelf next to the first Dewey book. I loved the stories in this second book, particularly about the author. It was an amazing read and as good as the first. My book club read Dewey and loved the book. I led the book club discussion as planned since I am an avowed cat person. I loved ‘Dewey’ and would love to win this book. My own kitties have certainly changed my life – for the better! I loved Dewey – cried like a baby at the end! I am very interested in this book and cannot wait to get to the bookstore to find it! i loved the 1st book! No need to enter me-I have read and loved this book. I am an avid reader and a writer of published works. I write poetry, childrens books and research articles online. I love animal stories and have written two childrens books based on my time living with my sister and her three dogs. I would love to read this book. I read the first Dewey book and can’t wait to read this one too! Like you said, sequels are never as good, but that’s okay because I can’t get enough of Dewey! I haven’t read the first book either. But I know I’m going to love it. The book trailer makes this one sound just GREAT! This book sounds like a great read and I would like to win it. As the proud companion of a ginger cat, I was glad to hear that there was another Dewey book. Live on, Dewey! I would love to win the book Dewey’s Nine Lives! I loved the first Dewey book and this one looks interesting. Since they’re looking for new stories, I guess they’re going down the ‘Chicken Soup for the Soul’ franchise route. I’m excited about this new book. I just LOVED the first Dewey book, and recommended it to several friends. Why did I never read this book? My teenage daughters(who just lost their cat Simon)would love it. I loved the first Dewey book and would love to read this one too! We loved the first Dewey book so we would love to be add our name to try to win this second book. Thanks for that great review of the book. I am reading a book that you reviewed and it is a great book. Take care and have a good week end. I loved the first Dewey book! I’m a real cat person – I raise foster kittens for the local humane society and have multiple cats of my own! Please enter my name in the drawing. Thank you. We would love to win this book! We both enjoyed the first one very much.